Do you suffer from neck, back or shoulder pain and are in need of a trusted local Osteopath to help you from your discomfort? Richmond osteopathy clinic is located a short distance from South Yarra and has certified Osteos that are ready to treat and heal you. Getting to Richmond-Osteopathic Clinic is quick and easy due to the many options available from South Yarra. If you’re feeling capable to drive, South Yarra to Richmond is less than 2 kilometres away. Depending on traffic its only a 5 minute drive from you to us. 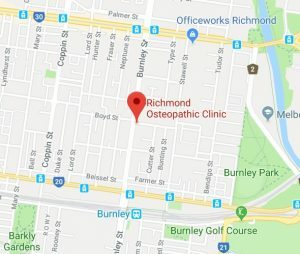 Richmond Osteopathic Clinic is just a short walk (approx 10 minutes) from Burnley station, just jump on the Lilydale/Belgrave or Glen Waverly line. There is plenty of free parking here if you stay under 2 hours. We’ll have you in and out before you can overstay and be given a ticket. If you arrive here early and wish to relax after your osteo treatment, there are plenty of great cafes close to the Swan Street and Burnley Street corner to check out and enjoy. All of the Osteopath’s at the Richmond Osteopathic Clinic graduated from Victoria University in Melbourne, and undertook a five-year double degree of a Bachelor of Science and a Master of Health Science, Mastering in Osteopathy. Their extensive training has given our Osteopath’s a thorough knowledge base, with an emphasis on anatomy, physiology, bio-chemistry, and biomechanics; along with the mechanism of injuries sustained to the musculo-skeletal system, and the relevant treatment and management of these particular injuries.